On October 21, Louis gave a talk, “The birth of a Novel: Cedar, Salmon and Weed,” at Simon Fraser University. He concluded his presentation to a “standing room only” crowd saying, “I think this story gives Boomer the life that was stolen from him and I hope you find pleasure in this tale.” The audience left after buying a bunch of books. 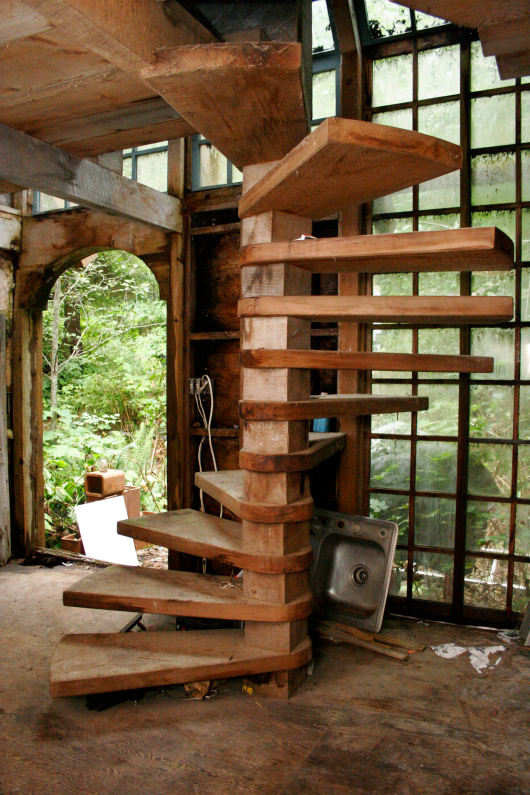 The spiral staircase in the fictional John Boom’s Cedar Palace. Artistic photographer, Ken Miner, records Cedar’s author and his wife Rae with his 113-years-old camera, Century View. They had to hold still for 30 seconds. “I didn’t know half a minute was so long . . . I think I blinked a few times,” said Louis. Ken Miner behind the Century View camera.